Hello there! Here’s another amazing vegan recipe I developed. 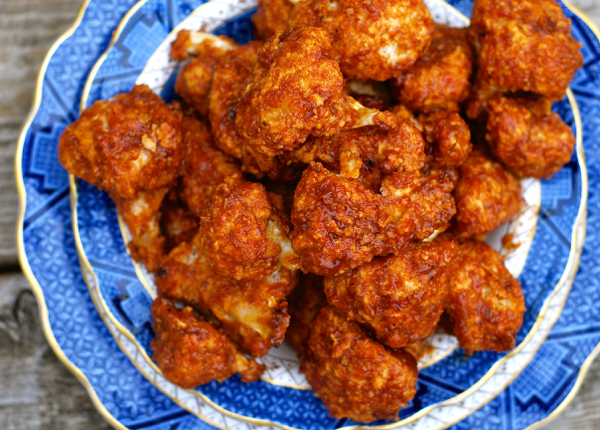 SO good in place of the traditional greasy, unhealthy, fatty chicken wings. An absolutely stellar party appetizer. Great for game day! Preheat oven to 450 degrees F. Line a large baking sheet with parchment or a Silpat mat. Remove leaves and core from the head of cauliflower. Break into large florets and then, using a sharp knife, cut each floret down the stem (so they stay together) to the size of an average “wing.” Make them as uniform in size as possible so they cook at the same rate. Mix flour, all seasonings, and milk in a mixing bowl. Add water as necessary to achieve a thick batter that won’t pool around the wings when you lay them on the baking sheet, but thin enough to slowly drip off after cauliflower is dipped. Like thick pancake batter. Place panko in a separate bowl. Dip “wings” one at a time in the batter and let the excess drip back into the bowl. Coat in panko, and then line them up on the prepared baking sheet. Bake for 45 minutes to an hour, flipping half way through cooking process. You want the wings to be golden brown, hot all the way through, and completely set. Once they’re done, remove them from the oven. Melt butter and mix with any desired sauce. Place wings in large bowl and pour sauce over them. Using a large spoon, gently toss so wings are completely coated. Serve immediately with your favorite vegan ranch, caesar, or blue “cheese” dressing. YUM!